I have a confession to make. I like rosé wine. Rosé wine gets a bad rap that can be traced directly to sweet, cheap California white zinfandel and Boone’s Strawberry Hill. My rosé love comes not from collegiate runs to the liquor store in town that doesn’t card, but from spending a few summers in the south of France, where Rosé is as common as water. 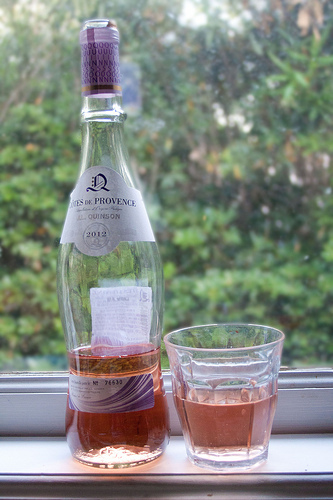 French rosé isn’t sticky sweet – it shows a lot of fruit but it’s dry and nicely acidic and goes well with food. Plus, when you drink it you can imagine yourself sitting at a cafe on the Côte D’Azur gazing out over the Mediterranean. And it’s pink. What’s not to love? I admit to being skeptical about JL Quinson Rosé when I saw it at Trader Joe’s. I thought it sounded like some Australian wine producer — I was mentally calling it Kwinsin in my head. 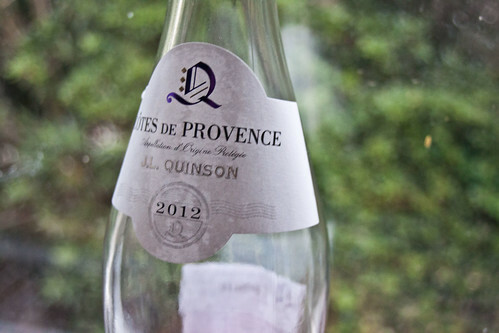 Turns out that Quinson (pronounced more like Cansohn) is a village in the Provence. Who knew? Also turns out that this wine is a very nice example of a French Rosé – very dry, with a nice acidity and some forward fruit. It’s a great light wine to drink in the summer. (and as you can see from the first photo, I enjoyed it quite a bit). I’d pair it with this Grilled Provencal Chicken or some Soupe au Pistou; for that true Riviera flavor. Some roses can be a bit thin or musty flavored, but this one has a nice freshness. If I had to complain, I’d wish this wine had a bit more fruit, and I always like a more assertive PINK, but at $6, I’m not going to complain too much. popped this open on Tuesday, drank the remaining 2 sips straight from the bottle last night. surprisingly not gross as far as TJ goes. This, and the $4 Mission Street Anniversary Ale are 2 of the best buys at TJ right now, me thinks. I *love* rose in summer. We’ve been shopping almost exclusively at TJ’s (it’s now around the corner) so I’m going to have to pick up a bottle of this the next time I’m there. I’ve edited my grocery list so I can get 90% of it at Trader Joe’s. Cheap wine is where it is! Guys, Quinson this is not a real producer. This is a made up brand to pump out substandard rose. Try some real quality rose like Château Montaud. Only a few buck more but you will taste real quality and value. Trader Joe’s is just a repackaging operation for cheap wine. Their food is not bad but the wine is repacked Yellowtail grade. there is no shame in loving rose` cause frankly, it’s the best wine you can drink, and it’s cheap as dirt. One tip, stay away from the “screw tops”. I have never met one that was good but I recently purchased a bottle of JL quinson, and let me tell you, God Tier doesn’t even begin to describe it. good to the last drop. time will tell whether the bottle survives the night or not. cheers!